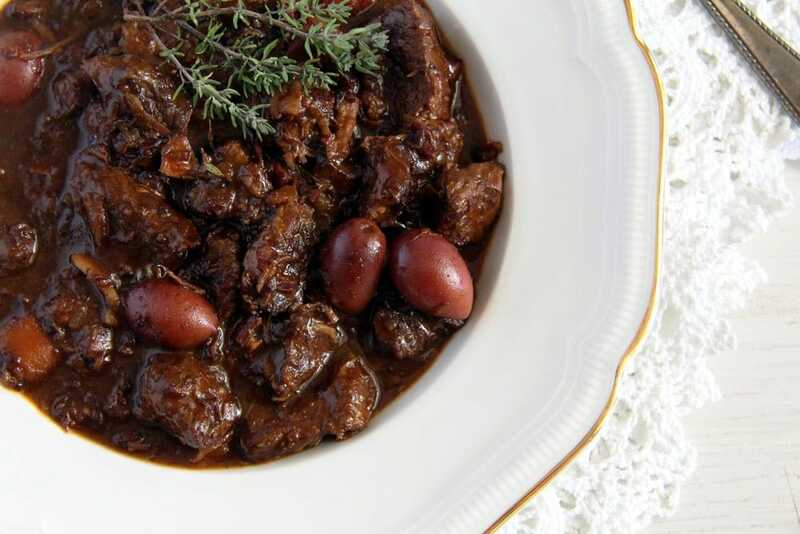 Daube à la bouef – a classic Provençal beef stew with tender meat pieces, a luscious red wine sauce and olives. , but I truly don’t even own one single French cookbook. What a shame! 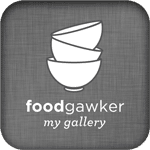 If you can recommend one you find really good and containing doable recipes, let me know. And by doable I mean not the kind of recipes that put you off cooking because they are either to laborious or time intensive to make or contain tons of butter, goose fat or cream. Or artichokes and truffles, which I wouldn’t mind eating if they would not be so hard to find or immensely expensive. I wonder how many of you will now think that I am a complete ignorant, but really, that is what I always associate with French cooking. But I am willing to learn, so don’t hesitate to teach me better. 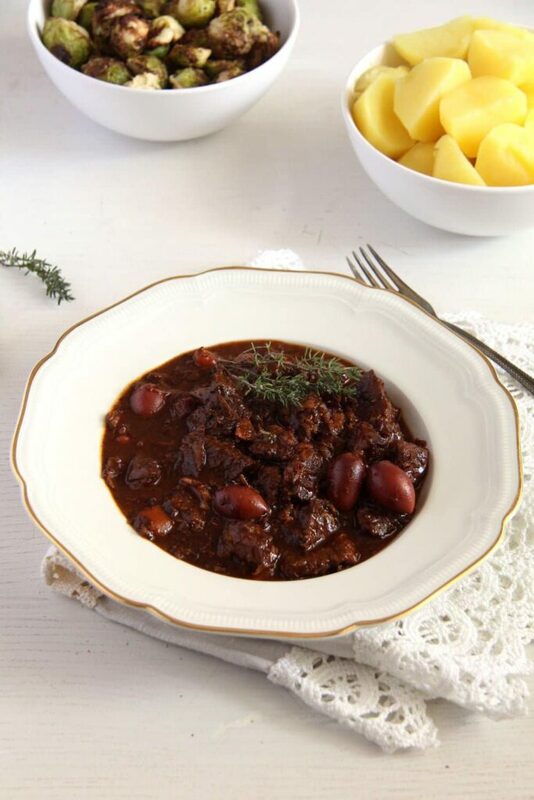 One thing I can tell you about this stew: it is so delicious that I can understand why people go crazy about the French cuisine. It is an easy dish to make, that is why I didn’t hesitate one moment after I’ve seen the recipe and the pictures in a magazine (Essen und Trinken). I was searching for something to make with a last, smaller batch of beef bone broth I still had in my fridge and this was the perfect solution. And I am thoroughly convinced that using bone broth gave the dish even more structure and flavor than I could have achieved using a plain either homemade or store bought simple beef broth. Simple beef broth is ok, but the bone broth has thousand times more flavor, if you ask me. When using simple beef broth I always have to “help” its taste with some beef broth granules or rather large amounts of salt. That is completely unnecessary in case of bone broth, the flavor is so strong, so concentrated, you will not need anything else, except a bit of salt and pepper. 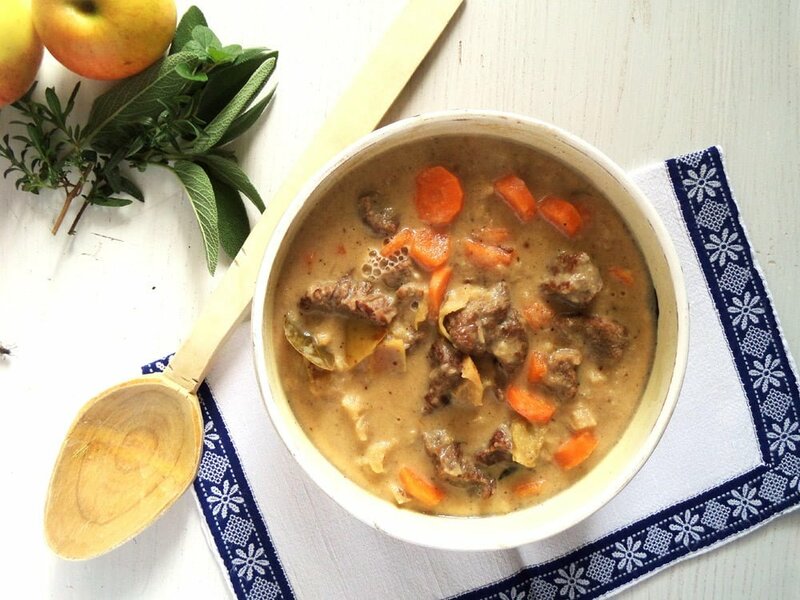 I am normally using my homemade beef bone broth for this kind of recipes, but if I happen to be out of it, don’t have time to make it or only need a smaller amount like in the case of this stew, than I like to use Kettle & Fire‘s organic beef bone broth. Give it a try, I am sure you will like it. Take a look at their product and if you decide to buy, don’t forget to include the promocode MYSPOON15 to your order and you will get 15% off your first order. 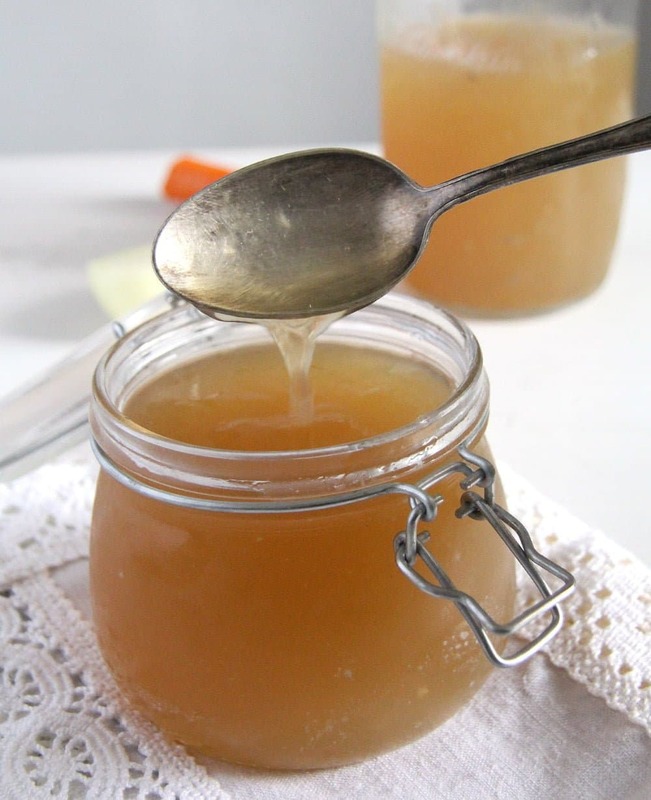 And if you would like to read more about beef bone broth, here is an interesting article talking about a bone broth detox, I found that to be a very good read. Finely chop the onions and the garlic. Chop the carrot into smallish cubes. Chop the beef into 3 cm/ 1.2 inch cubes. Place the cubes on kitchen paper and pat dry with another piece of kitchen paper. Remove the rind from the bacon (if it has any) and cube the bacon into small cubes. Give the rind of the bacon and the bacon cubes in a large Dutch oven/ stew pot. Let it render shortly, then add the olive oil and fry the beef cubes, in several batches, until nicely browned. Take the meat and bacon out of the pot with a slotted spoon and set aside. Give the onions and the garlic to the fat in the pot and cook until translucent. Add the chopped carrots and continue cooking for further 5 minutes. Add the tomato paste and cook shortly, then give the meat and bacon back to the pot. Sprinkle the flour all over the meat, stir well and cook shortly. 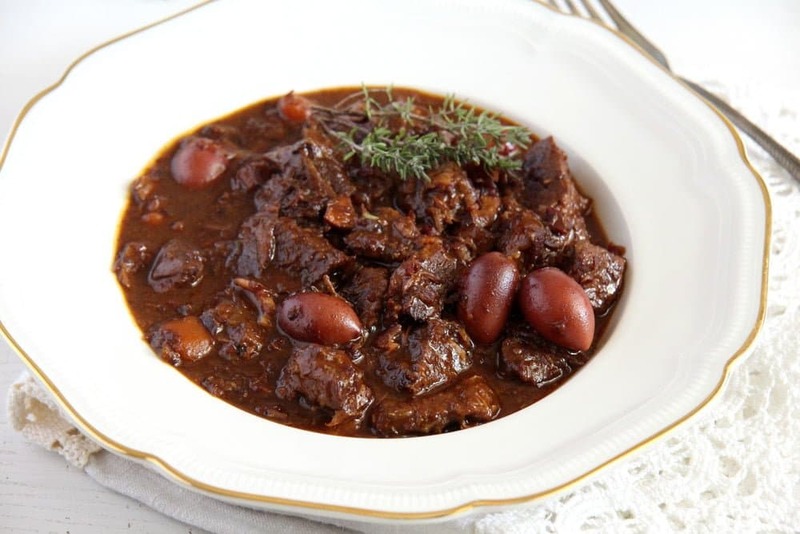 Pour the red wine to the stew and let bubble, stirring, until approximately reduced by half. Add the bone broth, bay leaves and thyme, reduce the heat, cover the pot and let simmer for about 2 ½ to 3 hours. Check after 2 ½ hours, the meat should be very very tender, if it is not so yet, continue cooking it. Stir once in a while to make sure that the meat doesn't catch to the bottom of the pot and check from time to time while cooking, if you feel that the sauce becomes too thick, add some more bone broth or water. When the meat is very tender, adjust the taste of the stew with salt, pepper and a pinch of salt. Add the olives and let the sauce simmer for another 5 minutes or so until the olives are heated through. This dish looks amazingly delicious! I love how rich the broth looks. Perfect dish for a cold fall or winter day! It looks really great! Those beef pieces look so tender and literally melt-in-mouth. Your stew looks wonderful! French cooking can be laborious, but the best French recipes are simple and straightforward, like this one. I am all over any kind of beef stew with red wine! Total comfort food up in here! I could eat this for dinner for DAYS! Cheers, friend! Looks amazing! I love a rich stew like this when it’s cold…perfect date night kind of meal with some crusty bread on the side. 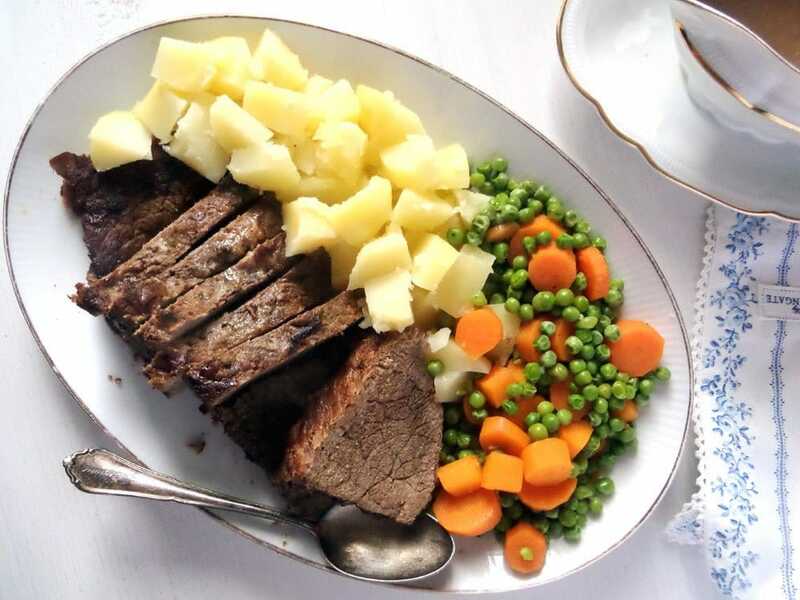 I’m making a pot roast tonight but need to have this soon! Your stew looks fantastic! I know beef with carrots, but have never tried beef with olives. Actually, from my experience I can say I’ve never eaten as light and as healthy as in French houses (including parties) and I think heavy dishes are occasional treats nowadays (just like in my house, but it concerns not only French cuisine, of course). I wish I knew and could recommend modern home French cookery books, especially written in English… I take my recipes from family, friends, internet and only traditional ones from the few French cookery books I own. I’ve heard Chocolate and Zucchini blog is great, but I don’t know it well. I think it contains both traditional and modern French cooking but also international cuisine. Draga nu e salata de bouef :)) the correct name for this recipe is “daube”, that’s it. 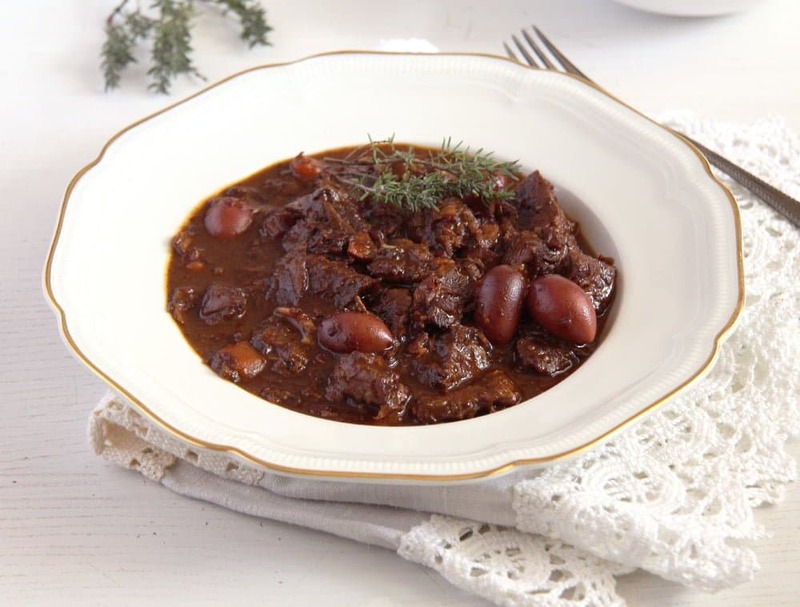 You can specify “de boeuf”, but most of the time that’s only done in Camargue, where the specialty is “daube de taureau” – bull daube. That’s a minor detail – I’m from South of France & your recipe looks delicious, looking forward to trying it!! Oh well, that it’s really detailed knowledge I could not possibly know, the only place in France I have ever seen is Paris. And we mostly ate baguette with goat’s cheese and drank wine there, no daube or any cooked meal at all… Thank you for the info and I hope you try the recipe. No idea how the original tastes but this version was delicious. haha yes sorry, by re-reading my comment it didn’t read as a positive one when really I meant this with an open heart! It’s always awesome to see people enthusiastic about the food from my region ♥ can’t wait to try it!